swisslet: how can we win when fools can be kings? "Brad and Angelina are divorcing?" 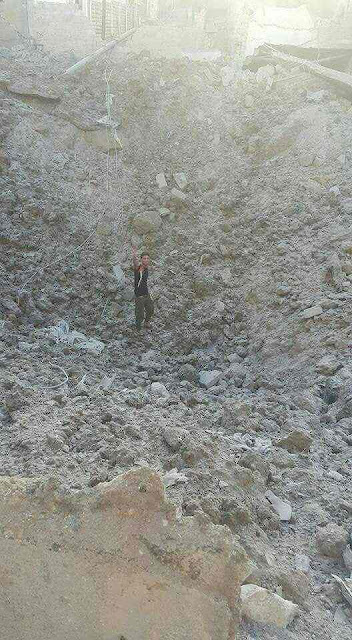 Apparently the Russians have started dropping 'bunker buster' bombs on Aleppo as they wage war on behalf of Assad. They are bombs that weigh more than a tonne and can penetrate through 2m of reinforced concrete. They're designed to destroy military installations; they're being used to decimate people's homes. I know these bombs were (allegedly) dropped by Russia, but I can't help but think back to the vote 10 months ago in the House of Commons to decide if Britain should join in the bombings. Remember Hilary Benn's much-lauded speech? "In the past week I have aimed to give a lead to the growing opposition to Cameron’s bombing plans – in the country, in parliament and in the Labour party. Rejection of 14 years of disastrous wars in the wider Middle East was a key part of the platform on which I was elected Labour leader. However bumpy a ride that has been in parliament, it is essential to learn the lessons of those wars. In the light of that record of western military interventions, UK bombing of Syria risks yet more of what President Obama called “unintended consequences”. The prime minister said he wanted a consensus behind the military action he wants to take. He has achieved nothing of the kind. After Iraq, Afghanistan and Libya, MPs thinking of voting for bombing should bear in mind how terrible those consequences can be." Unintended consequences. No kidding. Although, if you drop military hardware like that on cities, does the killing of civilians really count as an unintended consequence? I had an argument with someone the other day who was opposed to Corbyn and his leadership of the Labour Party. His position was that he believed it was worth surrendering 50% of his principles if that meant he could get into power and implement the other 50%; he called my position hopelessly idealistic. My position was that, if the principles you were prepared to sacrifice included things like an opposition to the renewal of Trident and opposing the bombings in the Middle East, then - for me - you've given up something fundamentally important. These are red-line issues for me and I can't understand why anyone would be prepared to give them up in an attempt to make themselves more electable. Don't get me wrong: I'm not blind to Corbyn's faults. I've worked for people like him before, and I can well understand how infuriating and difficult it must be.... but my sympathy stops when these apparently grown-up, responsible adults - elected to represent us, don't forget - can't bring themselves to see a bigger picture or work through their differences to provide meaningful leadership. We could use a functioning Opposition at the moment, no? They've tried to get rid of Corbyn over the summer and failed spectacularly; they have no credible alternative on offer, no desire (perhaps on either side) to compromise and apparently no understanding of the way their own party is changing around them. Apart from anything else, the behaviour of the Parliamentary Labour Party does nothing more than provide Corbyn with a handy excuse of blaming them for all of his party's (many) failings. Someone asked me if I would be voting for Corbyn in the leadership election. No. I'm not a member of the Labour Party. I've thought about joining a lot over the last couple of years, and I've had the sign-up page open on my computer several times... but I just can't get past the thought that they're all a shower of bastards and I'd be wasting my time. I don't think they want me as a member anyway. I look at that picture of that man in the massive crater, and I think about the mess we've helped to make in the Middle East... and then I look at the pathetic arguments that are taking place in British politics at the moment, and I feel like despairing. We deserve better, don't we?